Ah tis the season for the wedding fair. Or fayre, if you are so inclined. Between September and April us wedding industry folk are usually giving up a few weekends to dedicate ourselves to meeting future clients face to face. A battle ground for the suppliers all fighting to be your chosen one, we get to eye each other up, see who is offering what, and who are the trailblazers in the region. In particular, wedding fairs seem to have more wedding photographers than anything else, and good shows are hard to get into if you have not done them before. We love doing wedding fairs, which makes us quite different to a lot of suppliers, particularly certain types of wedding photographers (you probably know the types I mean!) We have heard many a grumble about having to give up your Sunday to smile and endlessly talk about weddings. Tom and I love wedding fairs, we really do. We’ve never wholly felt comfortable with the notion of our website being the only shop window to prospective brides and grooms, as wedding photography is such a personal business. It’s so important you like your wedding photographer as a person, not just for their work. We like to tell people, we’re the guests you have to invite! Not for us is the usual table approach at a wedding fair. The first few we were exhibitors at, it never felt right standing behind a table, with people coming forward to just browse our wedding albums whilst they were on the go. It felt like we needed to sit down with people, even if it was only for a few minutes, to give them a true (if quick!) representation of what we do. The Autumn 2011 Wedding Show at Wimpole Hall was our testing ground, run by Wedding Link Herts, Beds and Cambs, this was our first two day wedding spectacular, and there was a best stand competition. So we had a good think about it, how would we like people to view our work, spend more time with us? The result of our thinking was our living room. We wanted prospective clients to be comfortable with us. So we brought our chesterfield chairs, fire surround, hat stand and lamp, as well as various other pieces from our house to make it feel homely. Pieces of our work hung around the stand so couples could hopefully imagine their wedding photos above the fireplace, which was finished by a gorgeous piece of floral design by Cambridgeshire floral designer Nicola Fowler of Mooi Flowers. We didn’t win the stand prize, but we had some fantastic feedback and found couples and their parents were definitely spending longer with us. Since then, we have never had a standard table at a wedding fair as it just doesn’t feel right. We love sitting with brides and grooms and hearing about their proposals, looking at the engagement ring and hearing about where they are in the process. To be honest, now we’re in 2013, we’re surprised to have not seen anyone copy us yet, but maybe because it’s quite a unique look. Every now and then a bride will say, oh yes I remember you from another show, which is great. It’s lovely to see their growing excitement and great to be helpful with suggestions for venues or other suppliers. As a bride, a wedding fair can be a brilliant place to get ideas – not just about what you want but also what you don’t want. Good wedding fair organisers will have a good range of each supplier in different styles and different budgets, so it can be a great way for you to decide what is right for you and your wedding. And that really is what it is about. It’s your wedding. Don’t get swept up in the wedding checklist of things that you think you want to have. Not sure about what dress style will suit you? Go and see one of the catwalk shows, most dress shops at the show will be showcasing their dresses on the catwalk, and will show a range of styles. Wedding fairs are also a good place to get offers. Most suppliers will have a show offer, something like a freebie or money off towards booking. Check their offer though, as it may have an expiry date – as a supplier, a show offer is a good way to get people to book you sooner rather than later. Beware the offers which are labelled ‘if you book today’ though. At a show you are seeing a limited cross section of suppliers, who in most cases have all paid to be there. Especially beware of any photographers with this offer. No one should be forcing you to make a decision that quickly! It really is important to do your research. If you really love a photographer, by all means email them as soon as you get home, or ask them to pencil you in, but allow yourself the right amount of time to be sure – it’s a big decision! You can also just treat the show as a good excuse for a fun day out, be it getting excited with your other half, or having a girls day out with your mum and your bridesmaids, most wedding fairs are a lovely way to spend a few hours together. We spent this weekend at not one but two fairs – well, sort of! 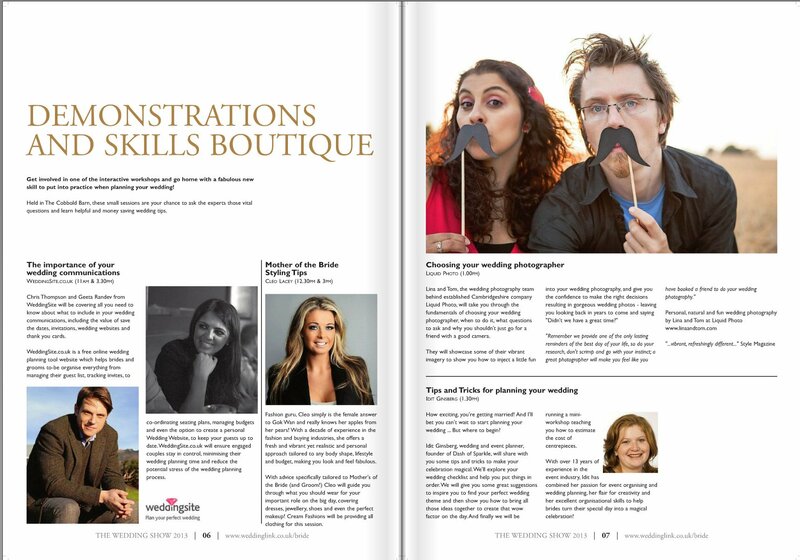 On Saturday and Sunday we exhibited at The Wedding Show Knebworth Park, a fantastic two day show with great catwalks and a seminar schedule. We were honoured and flattered to be asked by Wedding Link to present a seminar in their demo area about photography, and we gave a 20 minute presentation titled How to Choose Your Wedding Photographer and Make Sure You Get the Best Out of Your Photos! Both session were busy and we were delighted to hear many Brides and Grooms tell us we gave them food for thought, which is exactly what we wanted to achieve. There is a lot to consider when it comes to your wedding photos, and we wanted to help them make informed choices. 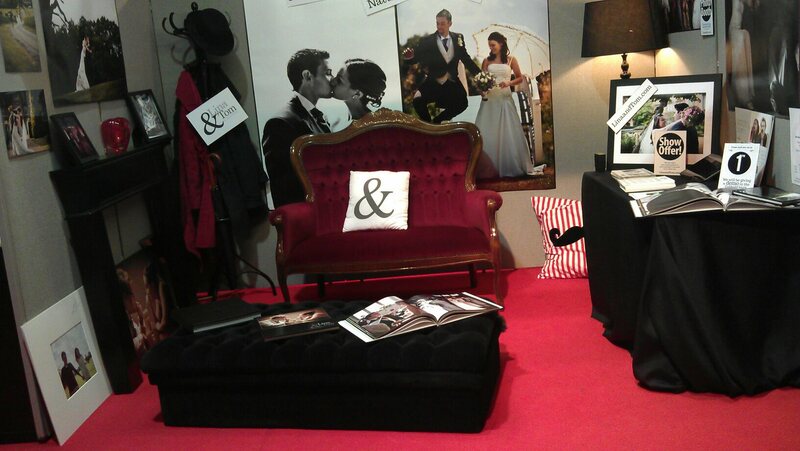 Again, our ‘living room’ concept stand went down well and we thank everyone who joined us on the Love Seat! On Sunday we should have been part of the second Hotel du Vin Cambridge Wedding Fair, an intimate exhibition featuring only the hotel’s recommended suppliers. As recommended photographer to Hotel du Vin Cambridge we are honoured to have a space in their fair, and after a great wedding fair in September 2012, unfortunately we found ourselves double booked with Knebworth for the January date. So we entrusted former clients and good friends of ours Aimee and Sam to cover the show for us, as we felt it would be great for couples to hear first hand from clients who had booked our services. They tell us Hotel du Vin had a great day and they were talking non-stop – so we can’t wait to catch up with some of the fabulous-sounding couples they met! Thanks to the lovely ladies at the hotel for looking after them. So if you are unsure about going to a wedding fair, I’d say go. Even if you think you want a small relaxed affair, have a wonder around to get some ideas. Sometimes seeing colours together or certain flowers can stoke your imagination, without you feeling that you have to have certain things and book certain people on your wedding day. Getting married is an exciting time, so go on, indulge yourself a little! Ps… apologies for some of the grainy phone pictures on here, but we don’t usually have time at a fair to get our cameras out! Thanks to Wedding Link for the snap of us doing our seminar.